Monday, September 10, 2001 found me in my Seattle, Washington studio gathering new material together for my portfolio and web site with photo editor Jenny Moore. In the course of pulling out files I came across a box of photos I had not looked at in five years. 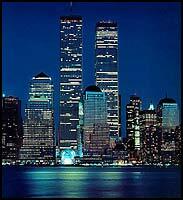 They were prints of photos I had taken on February 26, 1993 at the bombing of the World Trade Center in New York. I showed them to Jenny and she was amazed that anyone could have tried such an unlikely thing as blowing up the Twin Towers. At 6 a.m. the next morning, numerous calls from friends in New York and Washington, D.C. woke me, telling me to turn on the television. 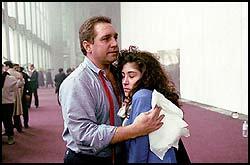 I watched in horror as the second attack on the World Trade Center proved to be more devastating than any of the terrorists could have hoped for. My wife and I absorbed the events of September 11, paralyzed in our bed until after noon. I was strongly feeling a great sense of relief that I was not in New York. I knew I would surely have rushed to the site of the Twin Towers as I had back on that day in 1993, despite a good chance that I too would have perished. At the same time, and just as strongly, I regretted being so far away. I felt that I was watching what might well be the biggest news story of my life on a television set from 3,000 miles away. I should have been there to photograph the events of that day. Many of my former colleagues were there and I missed the adrenaline rush that comes from competing with some of the best photographers in the world on a really big story, for the best photos to tell that story. This is what I spent the largest part of my life doing. I knew the World Trade Center from bottom to top and inside out. I spent almost every day after the February 26th bombing working on one story or another for months as investigators searched for clues and the cleanup and rebuilding went on. It took me a while to realize that there was another reason that I wish I had been there working on the story. For perhaps the first time I could remember, I was aware of feeling very strong emotions about what was happening in New York. For weeks after Sept. 11, I continued to feel them. I wanted to be there working on the story from morning to late at night for 7 days a week, because I knew that as long as I was working on the story, I would need to concentrate on telling the story for others with my cameras and could thus post-pone if not completely avoid the pain of processing those emotions. It was how I had been able to work on so many other heart-breaking stories in my career. It was a new experience feeling mortal like everyone else. After spending most of the day in front of the television, it was late in the afternoon before I went back to my studio for the first time. Sitting on my light table, still open was the box of prints I had been showing to Jenny the evening before. I could not help but feel a chill down my spine, somehow feeling there was a close connection between my act of opening that old box of photos the day before, and the events on September 11. For what it really means I do not know. Make of it what you will. Here are some of those photos. Many of the people in these pictures have black soot around their mouth and nose. Thousands walked down more than 100 flights of steps in unlighted and unventilated stairways. They breathed in smoke coming up from the fires below caused by a truck bomb in the parking garage, which gouged out a cavern five or six sub-levels high. Six people died and many more were severely hurt. Many lessons were learned from that day's experience in terror and many improvements were implemented in the months afterwards. There is no way to know exactly how many lives were saved on September 11, 2001, from the experience of February 26, 1993, but it is certain that the number of dead and missing would have been much greater. All Photographs ©2002 Daniel Sheehan. All Rights Reserved.